OPEN HOUSE - Join Us Sunday at Alta! We are opening our doors to you! 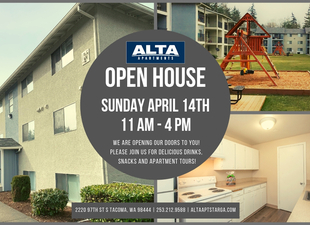 Please join us on Sunday, April 14th for snacks, refreshments and apartment tours! This is the perfect opportunity to meet the on-site staff, ask questions and begin the application process!